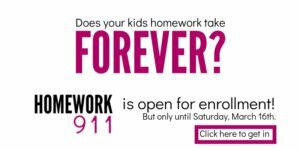 Have an afternoon home with your kids? 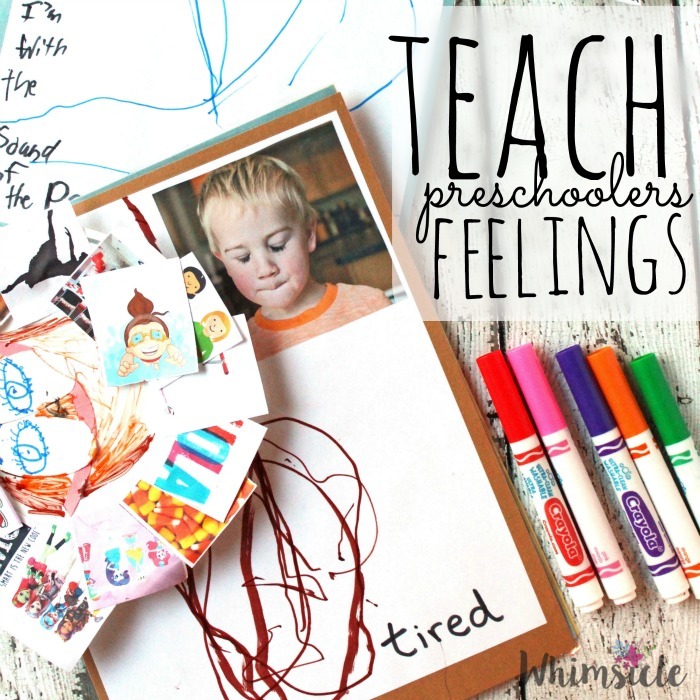 These activities are fun, easy and educational – they teach kids feelings. 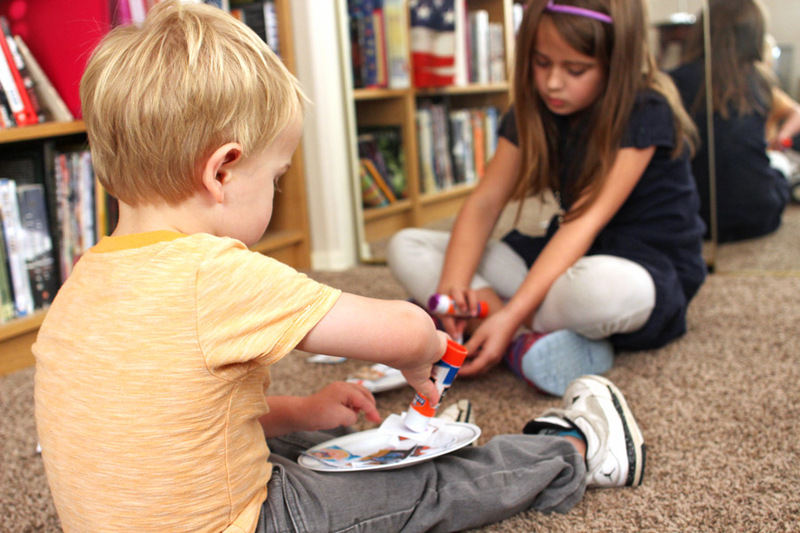 Visit your local library and get ready for some fun with your preschooler. I love visiting the library. My son and I sit on the large padded seats in the back of the children’s section and he brings me chubby, little board books that I read over and over again. Usually, these stories are pretty simple. Animal books with “meow” and “woof”. However picking the larger books has always been difficult. Which ones will my son like? What do other toddlers and preschoolers like? Can I turn that book into a larger activity that we can do this afternoon? A busy preschooler is a happy preschooler. When he’s having fun, he’s not doing forward rolls off couches or getting into his sister’s craft supplies. Definitely need to keep him occupied. Here’s what we’re going to do. I have two activities that not only keep your preschooler busy but will also TEACH at the same time! These activities are all about emotions. When kids can tell you and others how they feel, they communicate better. They’re able to express their needs and wants. Also, they can more readily recognize those feelings in other people. Being able to identify emotions is an important social skill. Children feel the same feelings adults do, but they don’t always have the words to express those feelings. Instead of saying, “I feel mad”, a child may throw a LEGO brick across the room or punch his sister. Knowing how to tell someone, “I’m mad at you,” prevents larger behavior issues. In Dr. Seuss’s book, emotions are expressed as colors. A purple day is a sad dinosaur stomping away while a yellow day is full of bees buzzing energetically. 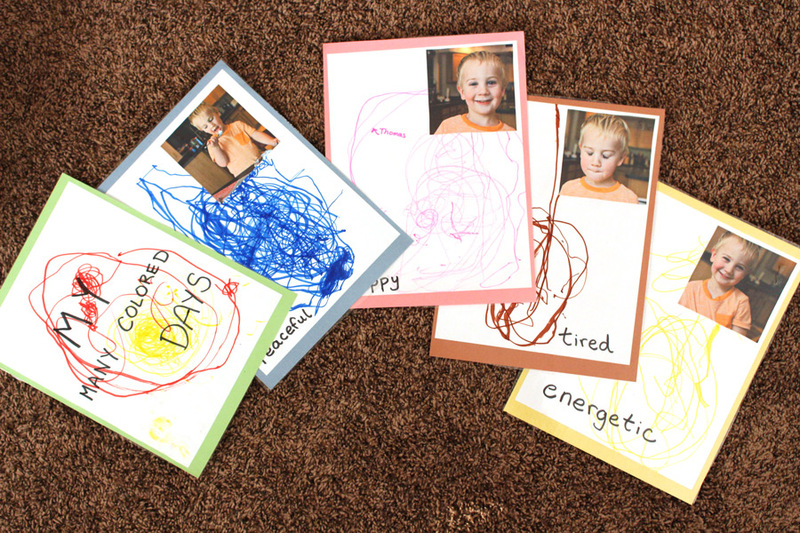 In this activity, you and your child will create your own Many Colored Days books that feature emotions and colors of your choice. To begin, I asked my two-year-old son which color he wanted. He told me blue. 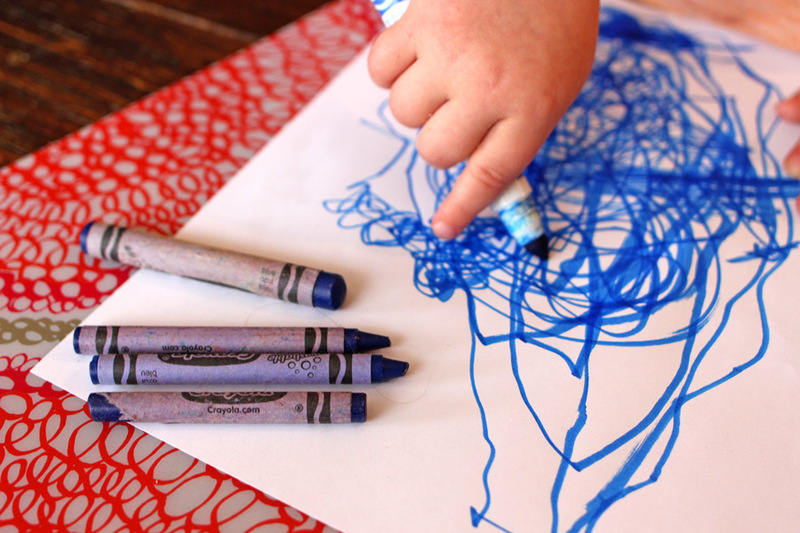 I gathered up all the blue coloring instruments I could find and let him work on his masterpiece. Exactly like Picasso’s blue period, right? Same caliber? When he finished, I told him how in Dr. Seuss’s book this color represented peaceful. We then took a picture of him looking peaceful. Now, my son has no idea what peaceful means, nor has any understanding when I explain it to him. So I snapped him in his most peaceful state – when he was eating. I printed the picture, glued it to the page and labeled it with the one word: peaceful. Even though he may not know the word peaceful now, after multiple readings of his very own book, he will know that word! Repeat this process for whichever colors you wish. Our book has four pages. I mounted each white page on a sheet of construction paper. Then, I laminated each page at a local teacher supply store, three-hole-punched it and bound it using string. For 4 to 5-year-olds, you can vary this activity by asking them to tell you a sentence using the emotion. You then write their sentence down instead of a single word. My seven-year-old daughter did this activity with us and she had fun writing her own stories using the emotions and making crazy poses. She starts asking others what makes them happy. Through her conversations, she realizes that happiness is all simple things. The book ends with her own happy list. Many kids get stuck in the sad zone without any clue of how to emerge. 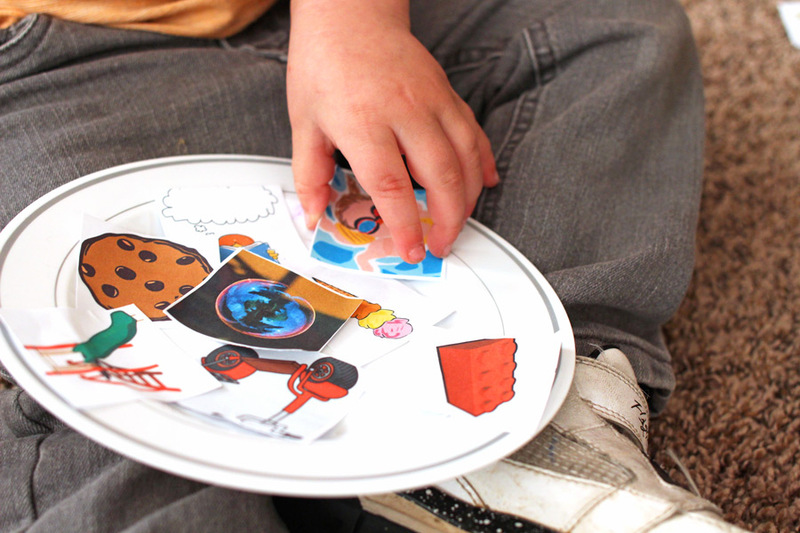 In this activity, you will be creating plates covered with the things that make your child happy. These plates make a fun wall decoration and are an excellent reminder that whenever they are sad, these are the things that make them happy. A little prep is required for this one. Search the internet for pictures of activities you know that your child loves. You can search websites such as OpenClipArt.com to find free images that you can use. Or you can download the pictures I used by clicking here. 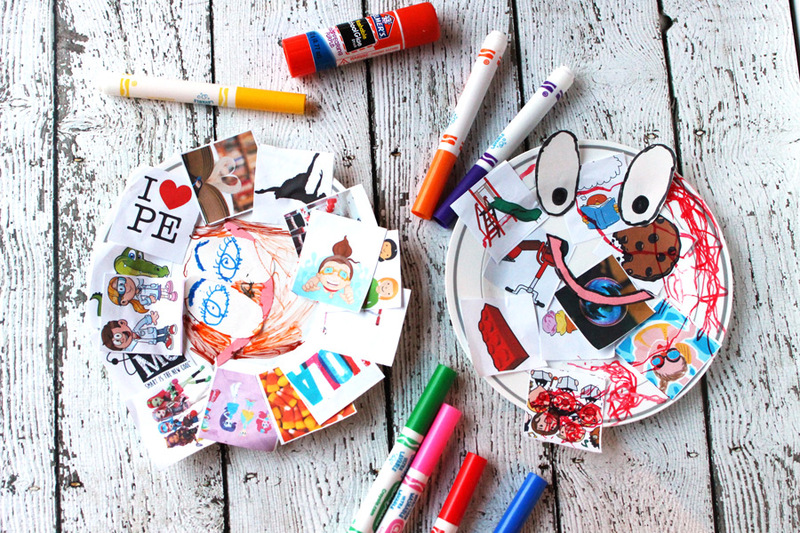 Cut these out and let your child pick and choose what makes them happy. Let them glue these on a small paper plate any way they choose. When your child finishes, glue on eyes and a mouth (or let them create the face themselves.). If you are looking for even more projects to explore feelings, a terrific company called Happy Heart Kid has an empathy kit. It includes four activities that teach your child to be more caring towards others in a very fun way. 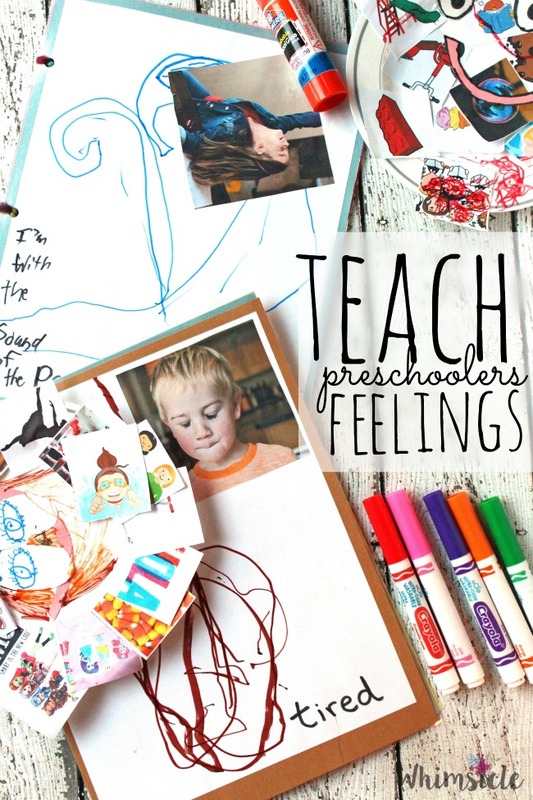 Now that you have an afternoon planned, which activity will you use first to teach kids feelings?